1. Windows doesn't recognize Trends UD-10 USB Audio Converter? Burr Brown PCM2704 IC may be burnt. Please send back to us for a repair. Take note that the Battery Pack must switch off when you remove the battery pack for a recharge or connect USB Cable to another PC/Mac. 2. I've found a 5.2 volt 1.0A power supply. Input is 100-240v 50/60 Hz 0.2A Can I use it safely with my Trends UD 10 USB Audio Converter? Yes !. The Trends UD-10 need about 100~150mA supply current at 5V. The 5V 2A power should be OK. But, please beware the polar of the plug! 3. What is the best choice for the power supply when I use Trends UD-10 USB Audio Converter? 4. Just want to know if the Trends UD-10.1 Lite USB Audio Converter grants digital and analogue signal at the same time so that we can use both outs at the same time without time delay between them. The outputs of digital and analog Trends UD-10.1(Lite ) USB Audio Converter is basically provided in the same time. The analog signal is decoded in the Trends UD-10.1 (Lite) USB Audio Converter with the internal DAC which needs a very minor processing time. It is not detectable by human ears. And, if the digital signal also decoded in other external DAC, it also introduce a similar process time delay and the final output analog signal is synchronized. 5. I do not want a separate DAC. How can I connect the Trends UD Lite USB Audio Converter to the Trends TA-10 amp. We offer an 3.5mm adaptor bundled with Trends UD-10 (Lite) USB Audio Converter for you to plug the adaptor to the HEADPHONE out and use a interconnect cable to TA-10 directly. 6. Why is Trends UD-10.1(or UD-10.1 Lite) USB Audio Converter built in D/A-Converter better than normal and external soundcards? - placed outside the PC case to prevent from the high EM wave interference generated by the high frequency computer components. - TI's PCM2704 is a professional audio IC designed with lower jitter, higher S/N ratio & lower distortion for high-end USB audio appliance instead of most sound cards using low-end consumer-grade ICs. Trends Audio applied some proprietary power regulation and digital signal processing & buffering techniques which differential UD-10.1 (or UD-10.1 Lite)USB Audio Converter from other normal & external USB sound card. 7.Which technical path goes Trends UD-10.1 (or UD-10.1 Lite) USB Audio Converter with its converters for a better sound with PC and Mac? Trends Audio applied the proprietary power regulation techniques (dual regulation for Trends UD-10.1 and single regulation for Trends UD-10.1 Lite version) which further enhance the purity of the power supplied to those IC and signal path. Meanwhile, a proprietary digital signal processing and buffering IC and related circuits applied which further enhance the performance of Trends UD -10.1 in lower jitter, higher S/N ratio and lower distortion. It also provides four concurrent outputs in different digital format (RCA Coaxial, BNC Coaxial, Optical and AES/ECU balance XLR). 8. Do Trends UD-10.1 (or UD-10.1 Lite) USB Audio Converter uses higher quality or better components than regular soundcards? All components applied in Trends UD-10.1(or UD-10.1 Lite) USB Audio Converter are Japanese or Korea brands high-end series components. In some key location, we applied audiophile grade Japanese ELNA Silimic series capacitors & Germany WIMA MKP-10 series capacitors. 9. Can we use any 4xAA 2300mAh (or bigger capacity) rechargeable batteries (i.e. GP, Duracell or similar) for your Battery Pack? Yes! You can! However, the rechargeable battery must be 1.2V x4=5V. Please do not use normal batteries with 1.2V x4=6V as it would be too high for safety and burn the PCB Board. 10. Can I give AC3 or DTS signals via the Trends UD 10.1 USB Audio Converter to my amplifier? No. Trends UD-10.1 USB Audio Converter supports two channels (Stereo sound) only. 11.What's the difference between the Trends 10.1 and the Trends UD-10? Is the performance same? 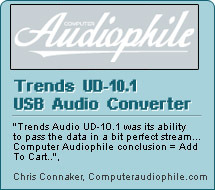 Trends UD-10.1 is using Type B USB input and the old Trends UD-10 is using Type A USB input. There is no difference in performance with Trends UD-10.1 and Trends UD-10. 12.Are both the TOSLINK and SPDIF output live/transmitting signal at the same time on the UD-10 when the device is getting signal from PC/Mac? Yes! Trends UD-10.1 applied RS422 driving IC to concurrently drive 4 groups of balance & non-balance digital outputs. All four outputs (Coaxial RCA or BNC, TOSLINK, and AES/EBU) are transmitting signals at the same time. You can connect up to 4 DACs simultaneously. 13. I have a pair of Dynaudio Air6 in my studio, the speakers has an input XLR Digital. Can Trends UD-10.1 work with my speakers? Yes. Since Trends UD-10.1 supports XLR(AES/EBU) digital out and the Air6 supports this input, they can work together.